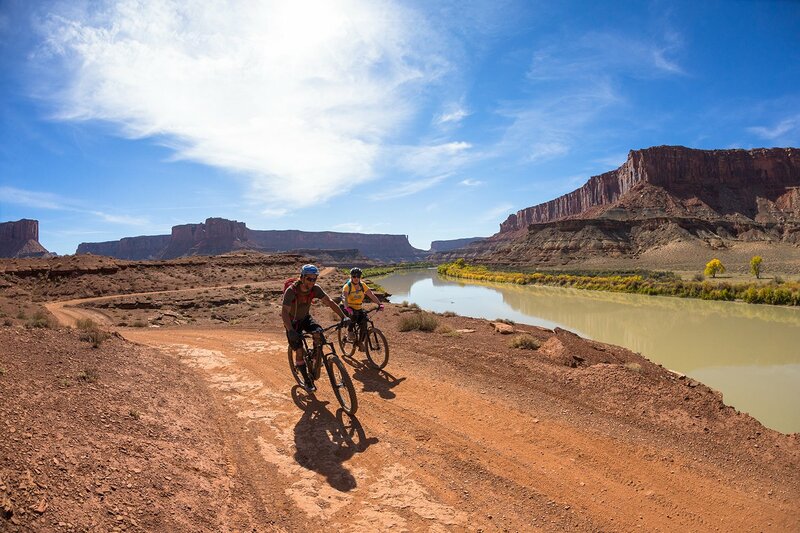 This is a mountain biking and river rafting trip like you’ve never experienced before - combining some of the most beautiful riding in the world with Utah’s premiere river rafting over 7 days. After three days on mountain bikes following the White Rim Trail and its meandering course high above the Green and Colorado rivers, the white sandstone bench descends to the river bottom, and your whitewater journey begins. 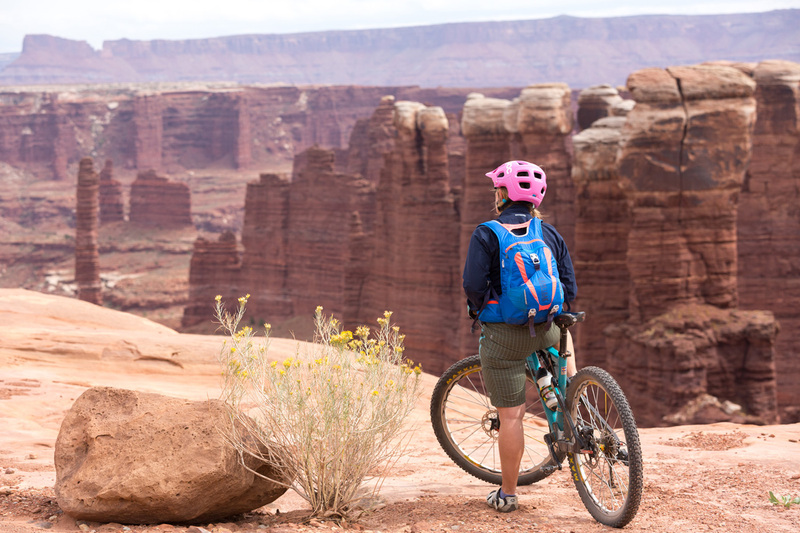 Biking and rafting will be your primary means for travel through the Canyonlands National Park, with side canyon hikes through ruins and petroglyphs to delight you as you head toward the confluence of the Colorado and the Green Rivers. 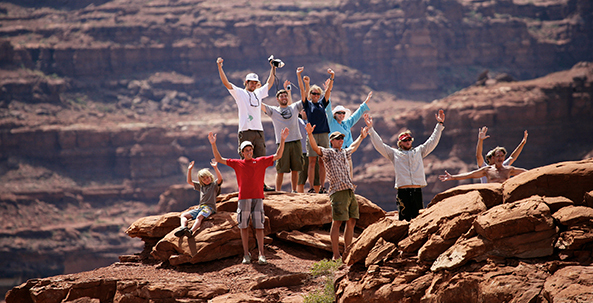 This Canyonlands mountain biking and rafting trip, powered by Holiday River Expeditions, will be one you’ll never forget. 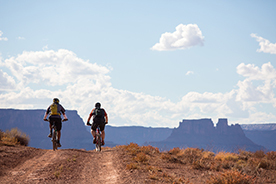 The White Rim Trail is a Utah classic, combining the great riding of areas like Moab, with epic scenery over a total length of almost 100 miles. We’ll be riding about 65 miles of the trail on the first half of this multi-sport adventure. 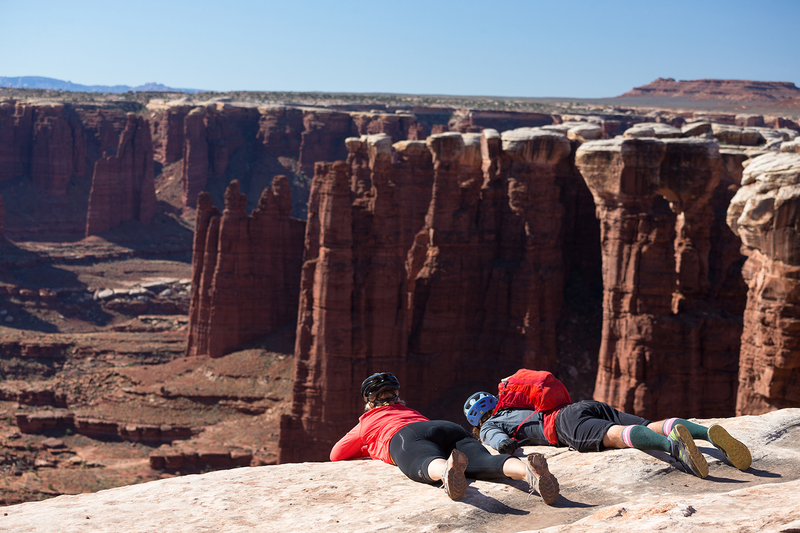 Supported by guides and vans you'll be riding high above the canyons below. The riding isn’t overly technical, which is good because you’ll have a hard time keeping your eyes on the trail with all the scenery. 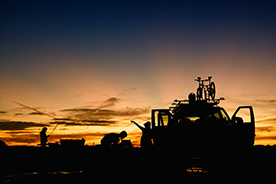 It’s a ride for every mountain biker’s bucket list. 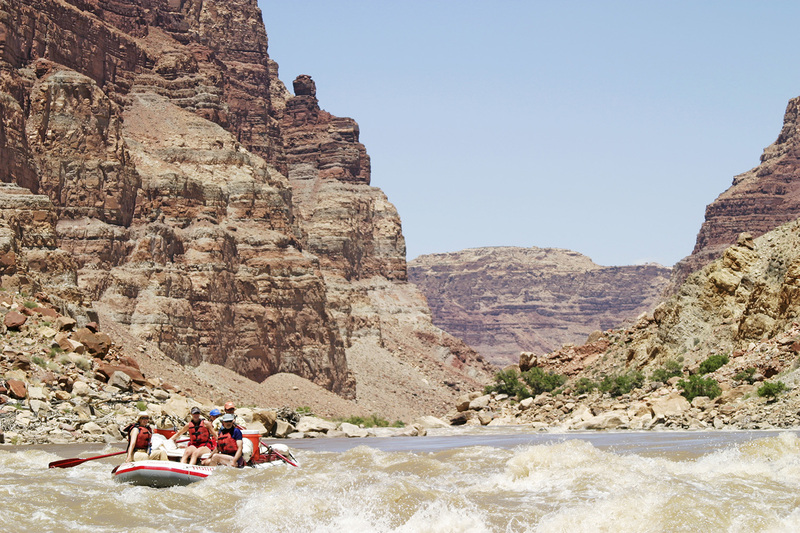 Cataract Canyon’s rapids rank along with those of the Grand Canyon in power and difficulty. Cataract also contains mile after mile of rafting through canyons where you are awestruck, not only at the whitewater, but the deep multicolored canyons of this section of Canyonlands National Park. Once you reach the confluence, the Colorado's behemoth rapids emerge. Rapids 15 through 23 comprise Mile Long and The Big Drops, a fall of 80 feet in less than four miles--one of the Colorado's steepest descents. Note: One of the advantages of a bike/river trip is the flexibility of the daily itinerary, because of changes in the river's speed the White Rim/Cataract trip varies slightly with the time of season that you go. The May trips usually meet up with the rafts in mid to late afternoon of the third day out. The September trips will meet up with the rafts prior to lunch on the third day. Subject to change based on conditions. Meet in Green River, Utah at 7:00 a.m. A two-hour van ride to the head of the Shafer Trail marks the start of the trip. The first day's ride will take the group down the switchbacks of the Shafer trail before cutting back south toward Musselman Arch. The trail continues to wind southward as it follows the meandering course of the Colorado River. Camp on this evening is made at or near Gooseberry Canyon. Our ride today will take us over undulating roads past the white, sandstone-capped monoliths of Monument and Twin basins. Then in the afternoon we will head up to Murphy's Hogback, one of this trip’s challenging uphill stretches. After conquering the hill we will set camp for the night. Today, we’ll turn back north and will follow the contours of the Green River. We ride around the labyrinths of Soda Springs Basin and by Candlestick Tower before reaching the rafts at either Labyrinth or Taylor Canyon (May), or Beaver Bottom (September). 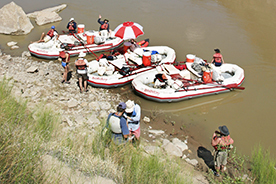 The river's smooth current transports our rafts to stops at Valentine Bottom or Turks Head where we will observe prehistoric Indian ruins & petroglyphs. Quiet beaches, hidden canyons, and refreshing water fights are common throughout this section of the trip. We’ll reach the confluence of the Colorado and Green Rivers today. The Ute Indians believe the Confluence to be the center of the universe. Just below the meeting of these two rivers enjoy a view of the Doll House, an appropriately named collection of freestanding, sandstone columns. Today we have the option for an early morning hike into the Dollhouse. Ascend steeply to the canyon rim in the Maze District with red rock formations. After descending to the river, the rapids of Cataract Canyon await. The climax: Big Drop Rapids with Little Niagara and Satan's Gut. 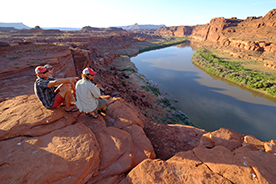 Begin the journey through majestic Glen Canyon and the former high-water mark for “Lake” Powell. Aided by motorboat “Hayduke” during higher lake levels, you’ll finish the trip at Hite Take-out. A two-hour drive brings you back to Green River. We will disembark at Hite, Utah. Our expected time of arrival back at headquarters is 5 - 6 PM, putting your bike and rafting trip through Canyonlands National Park at an end! The White Rim Trail and Cataract Canyon trips carve their routes around the ‘island in the sky’ between the Green and Colorado Rivers. 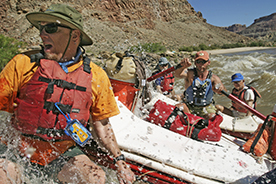 These guided Canoyonlands mountain bike & rafting trips will start on the Green River side of the drainage and meander through Stillwater canyon to converge at the confluence of the mighty Colorado. 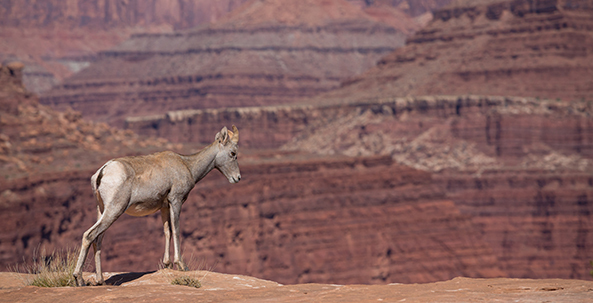 Cataract Canyon runs through the heart of Canyonlands National Park. 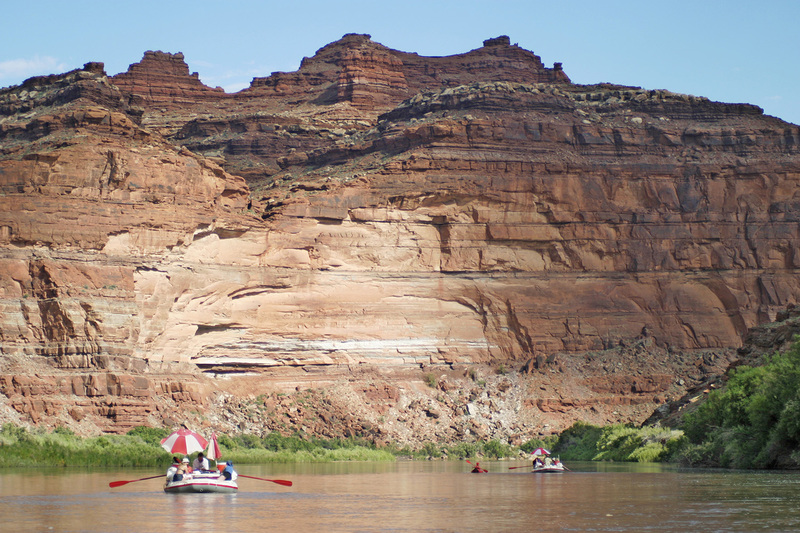 After all the rapids you can handle the river enters Glen Canyon National Rec. area where we take out below the confluence of the Dirty Devil. Feel free to bring your own mountain bike, or you can get a rental (full-suspension Specialized Camber Comp) from Holiday River Expeditions. If you bring your own, please make sure it's in tip-top shape before you arrive. As for weather, in the early and late seasons (May to mid-June and late-August to September) the daytime temperatures are 70 to 90 degrees, with nighttime temperatures 50 to 60 degrees. It seldom rains in, but when it does, it can cool temperatures considerably in May and September. There will be an abundance of sun, so bring a hat and plenty of sunscreen. What will the camping be like? You'll be camping for the duration of the trip. You will need to either bring your own camping gear or rent a kit from Holiday River Expeditions. 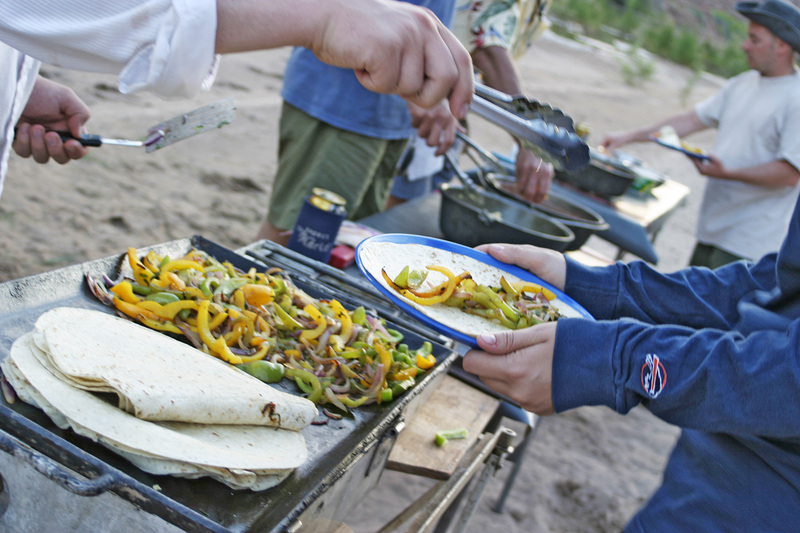 A camp kitchen and common area will be set up by your guides, who will also prepare and cook all of the meals. What kind of rider should I be for this trip? The biking portion of this trip is recommended for intermediate and advanced riders. A bike, waterproof ground cloth, poncho or rain suit (high quality), sleeping pad/air mattress, light tent, cup, and water bottle. You can rent a sleeping rental kit in one of two varieties, a basic sleeping kit which includes a sleeping bag, sleeping pad, ground cloth, rain gear and cup for $40.00, or the same basic sleeping kit with a two-man tent for $65.00. Rentals must be reserved in advance. Rentals requested the morning of the trip are subject to availability. Your bike must be in good repair. Holiday rental bike with helmet is available for $150.00/bike (full-suspension Specialized Camber Comp). If your personal bike fails to meet minimum safety standards you will be asked to rent a Holiday bike. Please note if renting bike - if you have clipless shoes you MUST bring your own pedals. Holiday rental bikes come with platform pedals only. What is included on this trip? All meals, snacks, and non-alcoholic drinks. Guides. Roundtrip transportation between the river and Holiday River Expeditions HQ in Green River. Van support for biking portion of trip. Rafting equipment (life jacket and 2 waterproof river bags). Camp chair. Bike repair kit. What is NOT included on this trip? Travel to and from Green River, Utah. Travel insurance (we recommend World Nomads). Personal camping gear (can be rented from HRE for $40 to $65). Mountain bike (can be rented from HRE for $150). BLM fee ($10). Alcoholic beverages. Guide gratuity. What if I need to cancel? Who do you recommend for travel insurance? If cancellations are made prior to 90 days before the trip, monies will be refunded less a $50.00 service charge per person. If cancellations are made within 90 days and outside of 60 days of the trip date monies will be refunded less a $100.00 service charge per person. Cancellations made within 60 days of the trip date are non refundable. We strongly recommend travel insurance in case you of accident, trip interruption, or in case you are forced to cancel your trip. I'm ready to book, what next? A $300 per person deposit is due at the time of booking in order to confirm your spot. The balance is due 60 days prior to departure. If you are booking within 60 days of departure, the full amount is due at the time of booking. 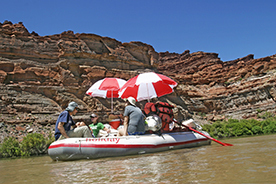 Once you book on evo.com, you’ll be introduced to Holiday River Expeditions who will help you prepare and plan for your trip. What is the minimum and maximum number of customers on each trip? Each trip will run with a minimum of 4 guests and a maximum of 12 guests. Is there a minimum age required for the trip? 12 is the minimum age for this trip. When and how do I meet up with the group? Most people fly into Salt Lake City, Utah and then make the three-hour drive south to Green River. Alternatively, you can fly into Grand Junction, Colorado, and make the hour-and-a-half drive west to Green River. Plan to stay in a hotel in Green River the night before your trip (not included). I am gluten-free / vegetarian / halal / kosher… will there be food options available for me? For all dietary restrictions, please let Holiday River Expeditions know prior to the trip and they will accommodate you. All meals are included. Breakfast consists of eggs to order, omelets, or blueberry pancakes, in addition to fresh fruit, yogurt, granola, hot coffee, juice, and tea. Lunches are deli-style with pasta salads, bagels, vegetables, chicken caesar salad wraps, deli sandwiches. Snacks such as fresh fruit, nuts, chips, and raisins are also provided. Dinners typically feature Dutch oven lasagna, chicken fajitas, or surf-and-turf on the grill, in addition to potatoes, fresh salad, and of course, dessert. Ice water, lemonade, and soda will be provided. 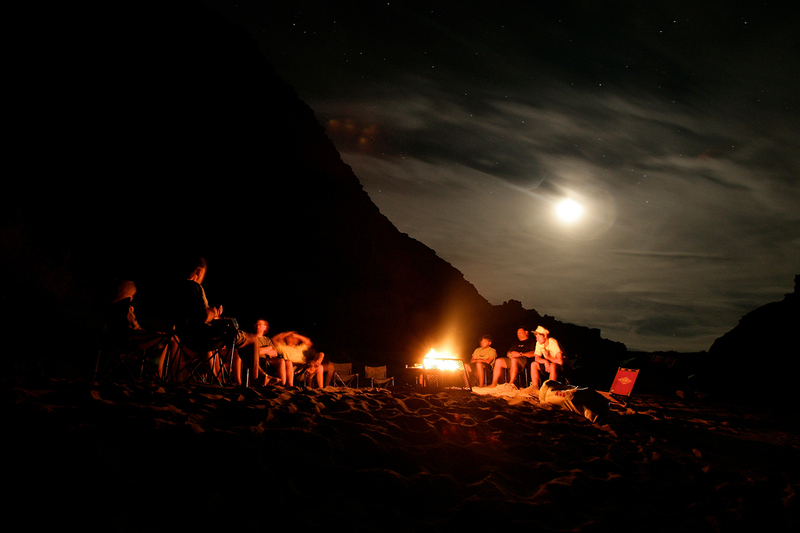 You can bring your own alcohol or other specialty beverages and your guides will be happy to keep them cold for you. No glass please. Phenomenal everything! 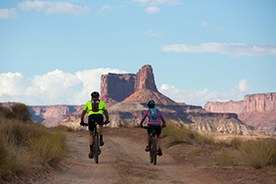 Canyonlands and the White Rim Trail is an adventure we consider repeating because of the awesome beauty and great mountain bike riding. The guides were outstanding. All were very professional, attentive to our needs, very friendly, and they worked their tails off the entire time, from sun up to long past dark. Thank you for the great trip. We had a wonderful time on the river with our superb guides -- both very knowledgeable about the river flora & fauna, water conditions, geology & history. Susan & Rocky’s river running skills & experience are amazing. Sorry, this trip is sold out.